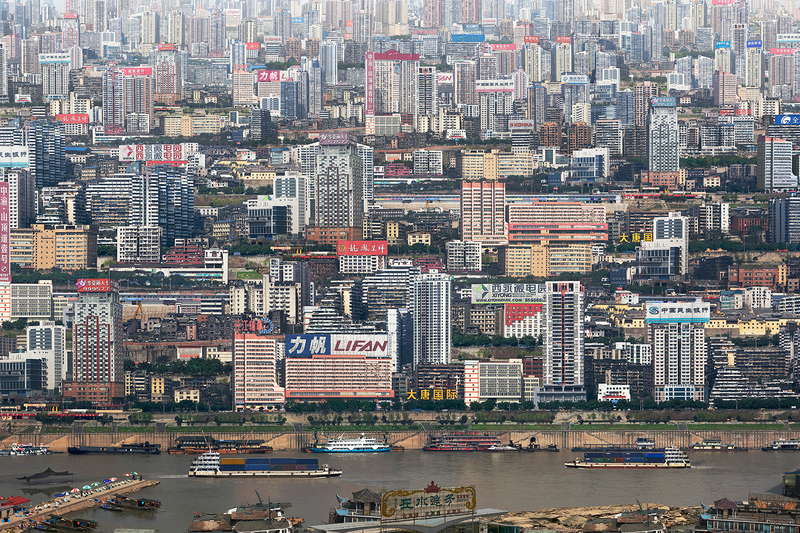 Chongqing is the fastest-growing urban mass on the planet. At over 31 million, its population is bigger than that of Peru or Iraq, with half a million more arriving every year. The streets hum with an army of 100,000 “bang bang men” weaving through the urban sprawl, transporting goods strung over their backs on their bamboo sticks. Chongqing epitomizes the shift of man as a rural to an urban being. Set on the confluence of the Jialing and the Yangtze rivers the city became a provisional capital during WW2 as its heavy fog protected against the Japanese airforce. In the nineties Chongqing was used by China to spearhead development of its Western regions. According to the World Bank, 16 of the planet’s 20 dirtiest cities are in China and Chongqing is one of the worst. Allegedly the city produces 3,500 tons of waste every day. None is recycled.